Get creative with your branding skills by designing a new name for UNSW's cross-faculty institute. The winning pitch will receive prize money of $500, and your proposal will be presented to the steering committee for ‘Design Y’ as a potential new brand name. Did you come to UNSW because you are interested in global warming, pollution, chronic diseases, bad traffic, inequality, or problems our ageing population is facing? Do you want to find solutions to these issues? Maybe design is your way! UNSW offers a number of design programs and courses, however, these go under many names and disciplines. Many of the challenges currently facing society require cross-disciplinary solutions and collaborative problem-solving. UNSW’s answer to this problem is ‘Design Y’. The aim of this initiative is to transform the University so that it creates design-focussed graduates who are able to find solutions to large-scale issues. It will bring design content and industry into education, catalyse design research, and create social value beyond the market. It will be the intersection point where different definitions of design come together. ‘Design Y’ is a UNSW strategic initiative led by Professor Ilpo Koskinen. It currently consists of the faculties of Art & Design, Built Environment, Business, and Engineering. Combined, these faculties represent over 35,000 students. The University is a powerful change agent. You can help launch this exciting initiative by finding a name for ‘Design Y’! The competition is open to all current UNSW students from the Art & Design, Built Environment, Business and Engineering faculties. Students can work individually, or in groups of up to 3 people. 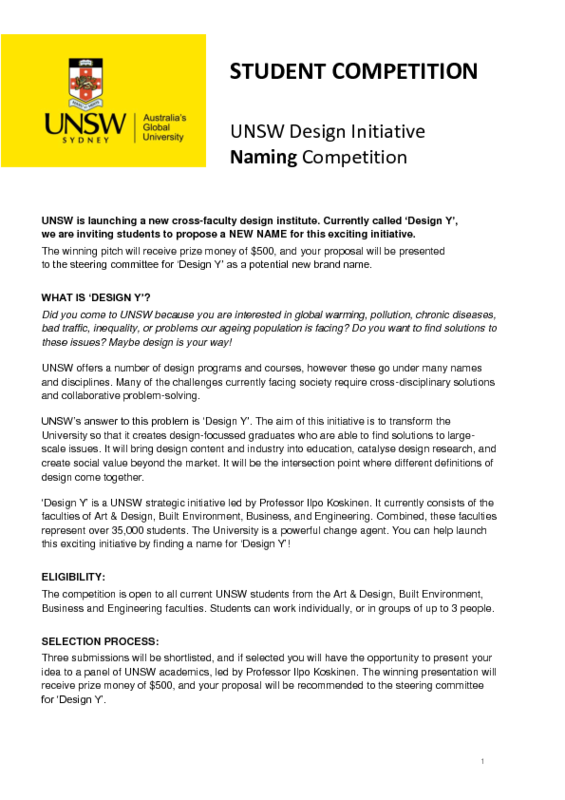 Three submissions will be shortlisted, and if selected you will have the opportunity to present your idea to a panel of UNSW academics, led by Professor Ilpo Koskinen. The winning presentation will receive prize money of $500, and your proposal will be recommended to the steering committee for ‘Design Y’. We recommend attending the briefing session with Professor Ilpo Koskinen (details below). This is an opportunity to hear more about the ‘Design Y’ initiative, discuss the brief, and ask questions. We will also discuss the marketing considerations required when naming a new entity. Closes: Tuesday 23 October, 2018 at 11:59pm. Note: The submission box will close automatically - no applications can be accepted after this time. This Moodle module will be updated with the briefing video and other helpful materials throughout the competition. You can also ask questions in the Discussion Forum. Registering early is recommended so we can see who is participating. If you have any further questions about the competition please contact Carly Vickers, or ask in the Moodle Discussion Forum. For more information, view competition requirements below.